Wolves Are Back In Germany, But Not Always Welcome Germany is seeing the return of wolf packs, and with them growing political tension over whether the animals pose too much of a threat. A wolf in its enclosure at the Hexentanzplatz zoo in Thale, northern Germany. Farmers and hunters drove the species out of the country over 150 years ago, but conditions for wolves became more welcoming in 1990, after Germany's reunification extended European endangered species protections to the eastern part of the country. Since 2000, the Central European gray wolves have been moving back, mostly from Poland. 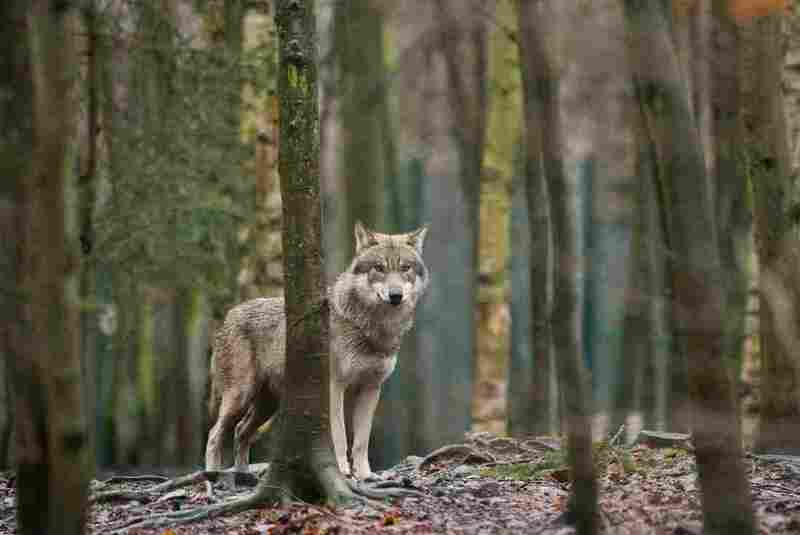 In Brandenburg state, which surrounds Berlin, the number of known wolf packs jumped from zero in 2007 to 26 this year, according to the state's environmental office. That has come as a shock to many farmers, who now have to worry about protecting livestock from predators. They don't lose many animals to wolves nationally, but the few incidents that happen can be dramatic. In April, at least 40 sheep were killed in a single attack, and news reports described the aftermath as looking "like horror." At an anti-wolf rally in November in Brandenburg's capital of Potsdam, farmer Marco Hintze said farmers should once again have the right to shoot at wolves. "If we miss him it's OK, if we don't miss him, [it shouldn't be] against the law, and that's what we try to fight for," Hintze says. He says government officials are insensitive to the worries of people living in the countryside. He thinks urban Germans have come to romanticize the returning wolves. "They think, 'Aww, it's a nice wolf, and he needs to be in nature and be free.' But people raised in the countryside, they don't need the wolf anymore," Hintze says. There are many similarities with wolf politics in the American West, where hunters and ranchers also criticize wolf restoration as a policy supported by urban environmentalists who don't have to live with the everyday reality of having the predator around. 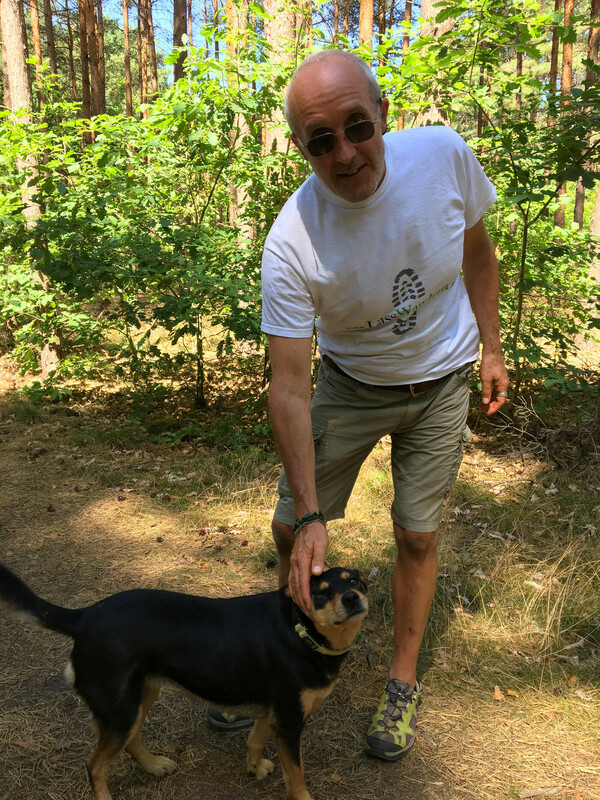 Soil ecologist Hans-Holger Liste out for a walk in the woods by his home near Berlin. He welcomes the returning wolf population in this region, and takes part in pro-wolf activism. Dirk Wellershoff, with the Brandenburg Hunting Society (Landesjagdverband Brandenburg), sees the returning wolves as a symptom of a bigger political problem. "I get the impression that our politics in all of Germany is getting distant from the people and our concerns," he says. "And we observe very clearly with the wolves how our problems aren't being seen ... and solutions aren't being found." Hans-Holger Liste, a soil ecologist who volunteers with a pro-wolf organization called Wolfsschutz Deutschland, says political attitudes on the issue mirror the left-right split that he's observed in the U.S.
"Definitely, I would say it's going to be the same," he says. In the last round of elections in Germany, "the Left Party and the Green Party were almost 100 percent pro-wolf, and the party of very conservative people were basically against wolves." By the "very conservative people," he means the Alternative for Germany, an upstart party on the far right that has built up political clout by campaigning against immigration — of humans. But now they're also against the arriving wolves. Liste says there are good environmental reasons to protect the wolves. The returning predators help to control the overabundant deer population, which in turn limits the damage hungry deer do to newly planted trees. He also acknowledges emotional reasons for supporting the wolves. Liste finds it exciting to have them moving back into the woods around his house in Beelitz, near Berlin. "If you meet them for the first time, it's like a spiritual experience. They stand there, they're not afraid of anything, they don't run from you, they just move slowly away," Liste says. He thinks most of his neighbors share his feelings, but he knows there's intense anger in other parts of rural Germany. Over the summer, in the eastern state of Saxony, authorities found the remains of a female wolf that had been illegally shot and then sunk into a lake with a concrete weight. "It was such a gruesome act of killing," Liste says. "As the media called it, it was like a mafia killing." He thinks some of the hostility toward the wolves is a remnant of fairy tales such as Little Red Riding Hood. He loved those stories when he was a kid, he says — though he usually sympathized with the wolves. The animal is likely to be an important issue in the next local elections, Liste predicts. There have been more high-profile incidents, including the report of an attack on a 55-year-old man in northern Germany in November. It's not certain it was a wolf that bit him — wolf attacks on humans are very unusual, and a subsequent DNA test of his wound was inconclusive — but the report threatens to inflame fears for the safety of children in rural areas. At the federal level, Chancellor Angela Merkel's ruling Christian Democratic Union party responded to the growing tensions by proposing a downgrade to the legal protections for wolves, which would allow for some hunting. Journalist Anna Noryskiewicz contributed reporting for this story from Potsdam, Germany.